Locking Fuel plug * Turn tampering away & enhance your peace of mind with this precision-fit fuel plug. * Easy on and off at the twist of a key. 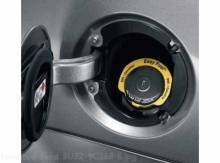 * For Use With Capless Fuel Filler System.